I’m building a pencil post bed for our master bedroom. The four posts, cut from curly maple, were chamfered to a tapered octagonal shape, first on the table saw and then with a 45° chamfer bit using a jig that allowed me to use a handheld router. 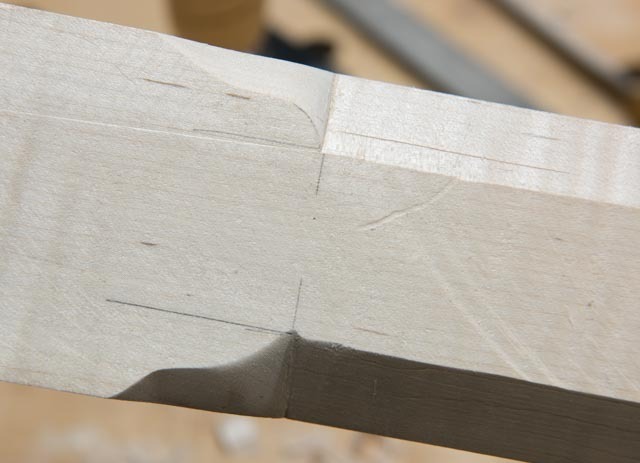 The router created a nice rounded transition at the point where the chamfers meet the square bottoms of the posts. That would have looked fine as it was, but I decided to add a traditional bit of decorative detail in the form of lamb’s tongues. 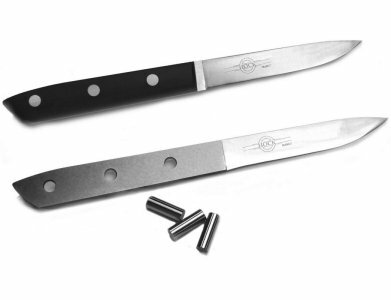 Lamb’s tongues are, in effect, stops at the end of a chamfer, followed by an ogee shape. 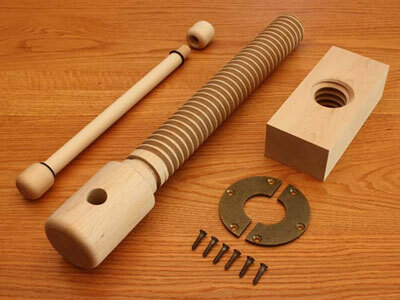 My bed posts are 2-3/4 X 2-3/4″ at the bottom, tapering to 1-1/2″ wide at the top. At the transition point, the chamfers are 7/8″ wide. I made a wooden template in the shape of an ogee based on 7/8″ intersecting arcs. I drew lines marking the location of the stops at the end of the transitions and the baselines that extended out from the edge of the chamfers, then marked the shape of the lamb’s tongue on both sides of the leg. I found that some adaptation was needed from one chamfer to another, since the width of the chamfers sometimes varied slightly. 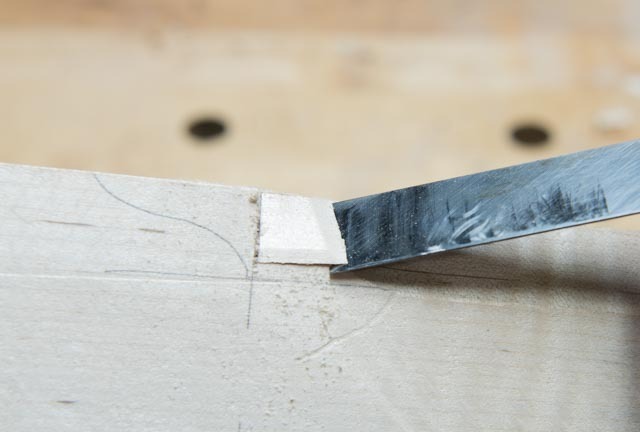 Once marked, I made a vertical saw cut at the stop line with a Veritas 14 ppi crosscut saw, being careful not to overcut the baselines. Then, using a Shenandoah Tool Works 1 lb. 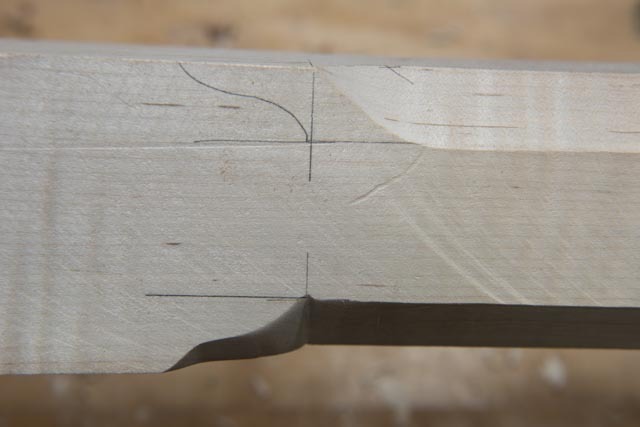 mallet and a sharp 3/4″ bench chisel, I cut away the waste between the chamfer and the stop with the chisel bevel down. 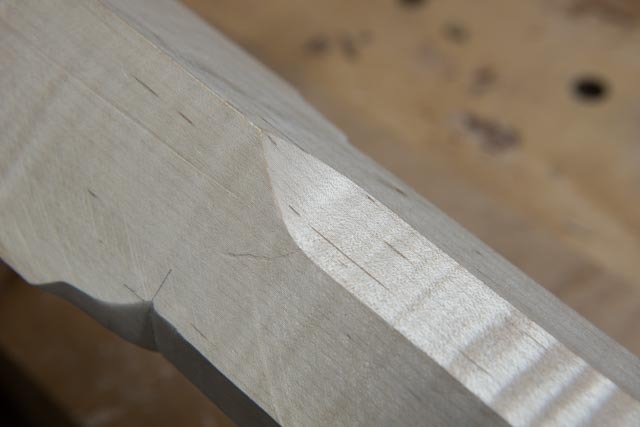 I smoothed the chamfer up to the stop with the chisel held flat and bevel up and followed this with a Lie-Nielsen chisel plane and a card scraper to finish the surface. The goal is to get a sharply-defined stop at the edge of the ogee. 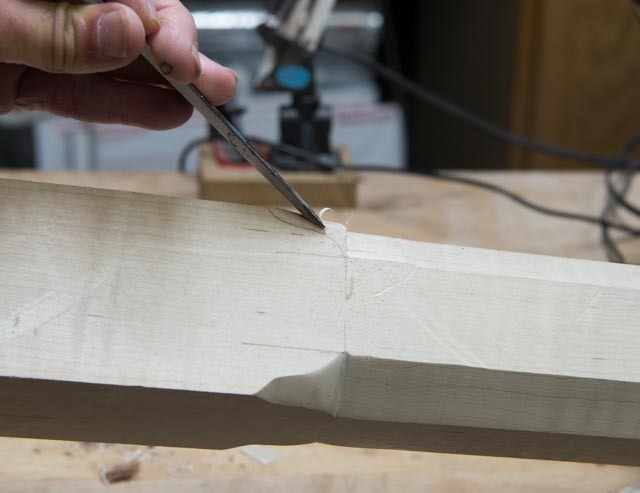 I then cut the ogees carefully by wasting away most of the wood with the mallet and chisel, again being careful not to overcut the line. I followed this with a #9 and #13 Auriou rasp, then sanded the surface to 180 grit to eliminate any marks from the rasps. The result: a nice traditional detail to dress up my bed posts. Since the beginning of recorded time, or so it seems to me, my table saw fence has been the repository of assorted things. Pencils, chalk, Allen wrenches and other paraphernalia have collected there along with wood chips and dust that could not be swept away for fear of losing some small thing that might have later importance. So what should I do about it? Live with it I could no longer abide. I needed a different solution. 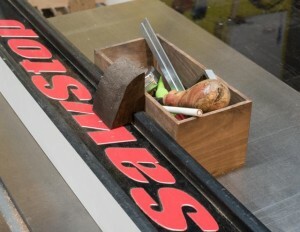 Somewhere I saw an idea that caught my attention: a small box attached to the off side of the table saw fence that could hold those things I need to keep nearby. As I thought about it, my gaze fell upon a partly completed walnut box that didn’t make the cut as a gift box, but would make a great storage box. It needed only a bottom to make it complete. I grabbed a scrap of thin walnut, cut it to size, rabbeted the bottom so it would fit the box and glued it into place. Reaching into my waste box, I found a chunk of walnut to use for a hook and handle. I cut a notch in the chunk to fit the lip of the table saw fence, then shaped it on the band saw and sanded it smooth on the belt sander. Because it was white wood from a larger walnut piece, I stained it dark to more closely match the box. Then I glued it to the box so the hook would engage the table saw fence lip. The resulting box is more functional than it is beautiful, but it does its job perfectly. And, it had the added benefit of using up things that had no other purpose! Now that is recycling at its best. A common feature in colonial American houses and taverns was the pipe box. A tall slender box, often featuring ornamentation on its top edges and sometimes incorporating a drawer for matches and sundries, it could hold a half dozen or so long-stemmed clay pipes ready for use. I really like the looks of these pipe boxes and though I won’t use them for pipes, decided to make one for my home, and it looked to be a fun woodworking project. If you check on Pinterest, you’ll find them in a variety of shapes and finishes. Some were simple in design, others quite ornate. Most older ones were painted. I chose to make a fishtail design, a fairly common pattern with moderate ornamentation, that I obtained from Charles Neil’s Mastering Woodworking web site. I began by resawing some curly maple boards to 1/4” thickness. 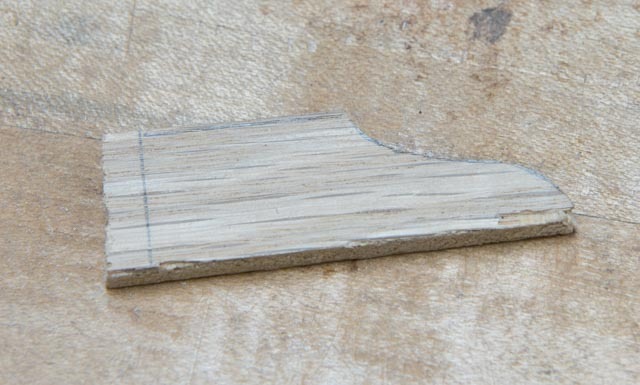 Then I made 1/8” plywood templates for the top and side pattern. I traced the patterns onto the maple and cut out the top edges of the box on the scroll saw. 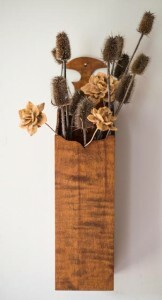 You could use a jig saw, turning saw or fret saw for this if you don’t have a scroll saw. I then trace-coated the maple with General Finishes Medium Brown dye, sanded it to 120 grit, and repeated this trace coating process before sanding to 180 grit. I sanded the end grain edges to 600 grit, smoothing the curves cut by the scroll saw as I did. I decided to make my box without a drawer at the bottom. I cut the parts to final length and assembled them with glue and pin nails. Once the glue was dry, I applied a mixture of 3 parts General Finishes Medium Brown to 1 part Orange water-based dye. When dry, I sprayed the piece with three coats of matte lacquer finish. If you prefer, you could use a less expensive wood such as poplar and coat it with Milk Paint for an authentic period look. Since we don’t smoke, we’ll use the box to display dried flowers. It would make a nice gift or holiday project. And, I’m told that these boxes can make good sellers in the craft marketplace.